October was an exciting month for us at Wooden Horse Corporation. To start, on October 12th the Equicizer made its debut on the Ellen Show! 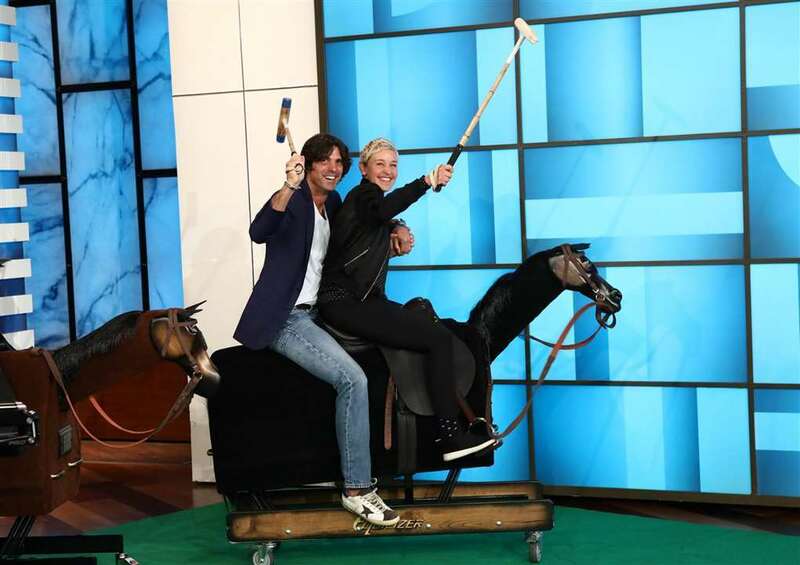 Ellen Degeneres and world class Argentine polo player Nacho Figueras "faced off" on a pair of Equicizers to raise money for breast cancer research. Click the image to the left to watch a video clip from the show! We were pretty thrilled when we received a call at the beginning of the month from Weta Digital - a visual digital effects company based in Wellington, New Zealand - that has had a hand in the special effects seen in hit movies such as Planet of the Apes, Lord of the Rings, Avatar, The Hobbit, and more. 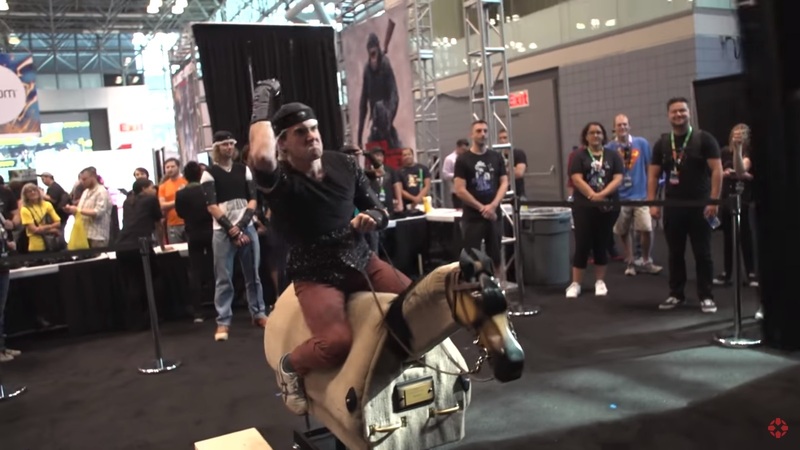 One of our demo Equicizer models, Bob, was the star of the show in Weta Digital's booth this year at Comic Con in New York City. 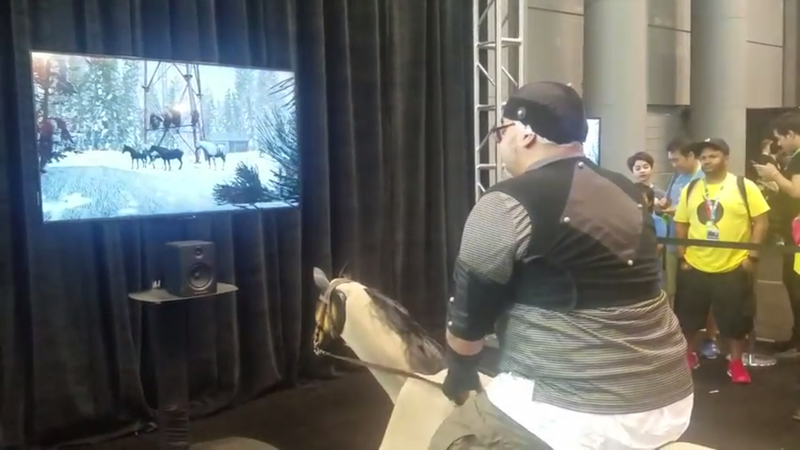 Hooked up to their digital software, excited fans got a chance to climb aboard the Equicizer and ride to a scene of Weta Digital's most recent movie, "War for the Planet of the Apes." Both images below will take you to videos from the big event! On Thursday, October 12th our brand new All Purpose Riding Pad debuted on Steve Lantvit Horsemanship's "SURE IN THE SADDLE" on RFD-TV! It was a great opportunity to see the pad in action on real horses. You can learn more about the All Purpose Riding Pad by visiting our "Online Store". Be sure to tune in to the upcoming Sure in the Saddle airing on November 16​th at 3pm and 11pm EST on RFD-TV. The episode was filmed at Whispering Grace Horses in Massillon, Ohio and will feature Equiczier creator Frankie Lovato, Jr and two Equicizers! As always, we encourage Equicizer owners and fans to follow along with us on our blog, Wooden Horse Wednesday. The blog content ranges from the behind the scenes action at our workshop to interviews with professional athletes to Equicizer workout ideas and more! Recently we have spelled out "The ABCs of Equicizer" and shared with readers a look at a faith centered Therapeutic Riding Program based out of Texas. Tomorrow we have the story of an equine veterinarian and polo player who used the Equicizer to rehab from a tibial plateau fracture and in 2 weeks we will be sharing some behind the scenes photos on our blog from the Whispering Grace Horses episode shoot. Check it out and subscribe today!